The rebuilt station building at Majdan. Photo BTWT. 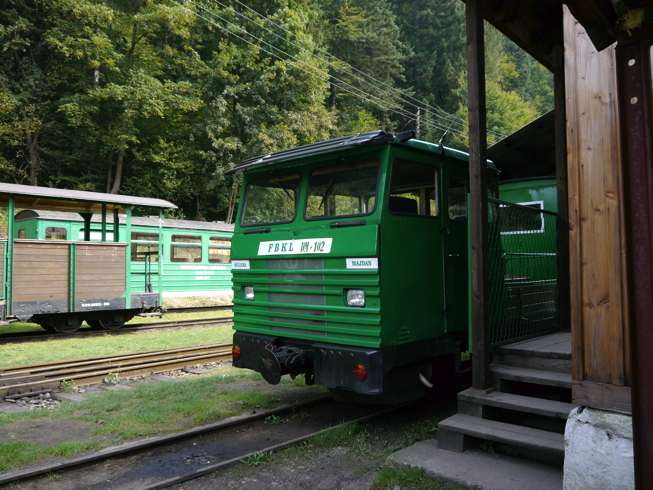 The Bieszczady Forest Railway is carrying out an ambitious programme of building restoration, passenger rolling stock refurbishment and track renewal assisted by funding from the EU. 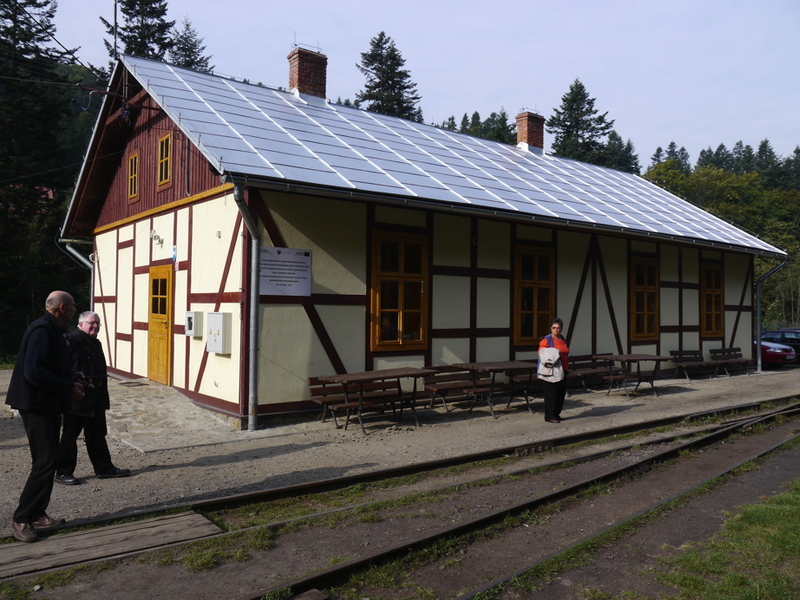 At Majdan the original station building and engine shed have been beautifully restored and a brand new toilet block constructed. The station building is almost 100% new. The original collapsed when its timber cladding – a later addition – was stripped away by builders. The restored engine shed. Photo BTWT. Asbestos has been replaced by galvanised steel on the roofs, and the engine shed has been insulated for the first time in its history. The railway management hope that this will make it possible to run trains during the January – February winter holiday season. New and old semi-open coaches rebuilt from freight van chassis acquired from other narrow gauge railways. Photo BTWT. LYd2-05 and LAS Tx 1884 outside Majdan shed. Photo BTWT. Majdan loconotive shed had been formally recommissioned the day previous to our visit. LYd2 0-6-0Ds make up the line’s staple motive power. 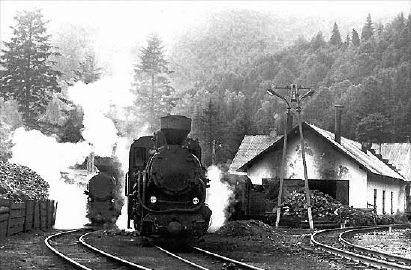 LAS 0-6-0T steam locomotives were employed when the Bieszczady Railway was rebuilt on new alignments during the 1950s. This example was previously plinthed and was restored by Zbyszek Tucholski and one of the railway’s original steam drivers. LYd2-01 in Husqvarna livery. Photo BTWT. Husqvarna sponsor the railway by providing equipment for cutting grass and line-side vegetation. Platelayers’ trolley fitted out to carry passengers Photo BTWT. When no trains are running, parties of 5 or more can hire this vehicle and run their own ‘special’. Plaque stating that the station building had been restored with the help of EU funding. Photo BTWT. The overall cost of the project is 1.76m PLN of which 0.69m PLN is coming from EU regional development funds, 0.12m from the government budget, and 0.63m PLN from the railway’s own funds. 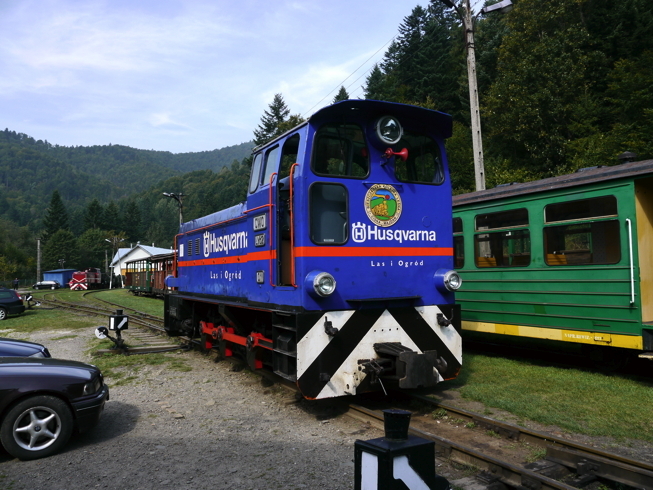 The high proportion of project costs that the Bieszczady Forest Railway Foundation has had to fund itself has put a big strain on the railway’s cash flow. Bieszczady Railway LAS, November 2006, at Majdan. I had seen little of Prezes lately. My own complete happiness, and the home-centred interests which rise up around the man who finds himself master of his own establishment, had drifted us away from each other, while Prezes, who loathed every form of society with his whole Bohemian soul, remained in our old lodgings, buried among his books, and alternating from week to week between lethargy and ambition. He was still, as ever, deeply attracted by the study of railway heritage, and occupied his immense faculties and extraordinary powers of observation in following out those projects, and assisting those railways which had been abandoned as hopeless by the official bodies. From time to time I heard some vague account of his doings: of his summons to Gora, of his clearing up of the singular tragedy of the lost Skansen at Karsnice, and finally of the delicate mission in which he was still engaged. Beyond these signs of his activity, which, when he permitted, I merely shared with our readers, I knew little of my former friend and companion. 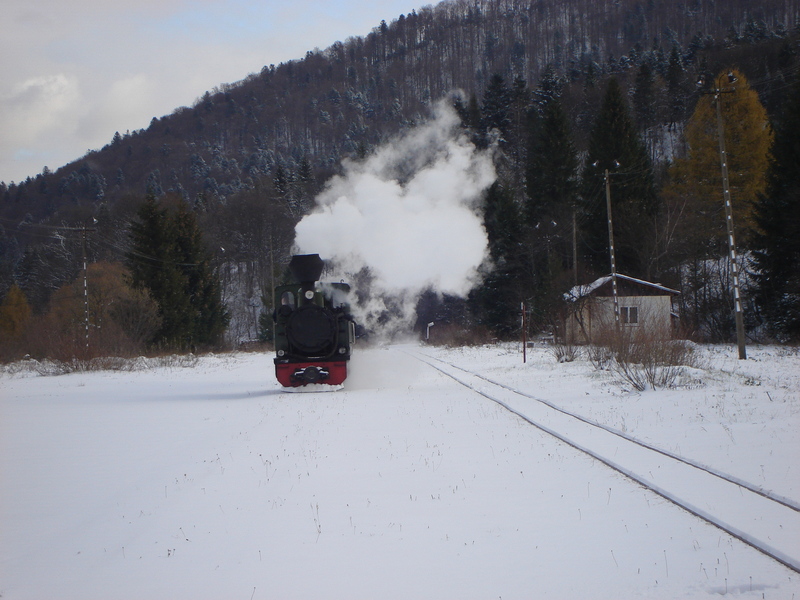 Bieszczady Railway LAS about to run round its special train at Dolczyca, November 2006. One night my way led me past the well-remembered door, which must always be associated in my mind with the dark incidents of the Study in Smigiel, I was seized with a keen desire to see Prezes again, and to know how he was employing his extraordinary powers. His rooms were brilliantly lit, and, even as I looked up, I saw his tall figure pass twice in a dark silhouette against the blind. He was pacing the room swiftly, eagerly, with his head sunk upon his chest and his hands clasped behind him. To me, who knew his every mood and habit, his attitude and manner told their own story. He was at work again. He had risen out of his stupors and was hot upon the scent of some new problem. I rang the bell and was admitted to the chamber which had formerly been in part my own. His manner was not effusive. It seldom was; but he was glad, I think, to see me. With hardly a word spoken, but with a kindly eye, he waved me to an armchair, indicated a bottle of Zubrowka and a dish of zimne noszki in the corner. Then he stood before me and looked me over in his singular introspective fashion. “Indeed, I should have thought a little more. Just a trifle more, I fancy. And you have come to consult me about the LAS that you found in Steeple Claydon. LAS on a PKP 600mm gauge railway somewhere in Poland. The photo was originally published in a calendar published by the erstwhile PKP Dyrekcja Kolei Dojazdowych in Warsaw which was responsible for Poland’s narrow gauge railways. The pictures, by M. Kucharski, J.Wardęcki, J.Zajfert, A.Gibek, C.Gwara, M.Moczulski, were then scanned and displayed on the Internet as an appendix to a brief on-line history of Krosniewice and its railway which was published in 2002 and is still hosted in its original state! “It is simplicity itself,” said he; “I regularly read your somewhat simplified accounts of my cases on BTWT and the comments that you publish from your admiring audience. Alex Fitch tells us that Steeple Claydon is not a million miles from Leighton Buzzard. Obviously if you live near that line and have a 600mm engine you would take it there. So it is not 600mm gauge. A brief glance at the trees on Google’s Street View – a suggestion from another of your admirers, who prefers to hide his identity under the nom de plume of Warwickian – would indicate that the engine has been at its present location for some time. I would estimate some 15 years, or more. This would coincide with the early to mid 90s, after the collapse of communism in Poland, the period when Polish sugar refineries were getting rid of their remaining steam engines. Now the majority of these employed 600mm gauge with the exception of those attached to the Kujawy Railway network which was largely standardised post WW I to 750mm. Hence, you see, my triple deduction that the engine was 750mm gauge, had come from a sugar refinery, and had been based in central Poland. “You have your engine, Dyspozytor,” said Prezes, pouring himself a glass of Zubrowka and languidly sinking into his armchair. 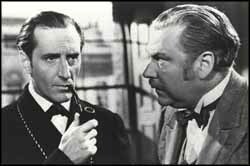 With apologies to Sir Arthur Conan Doyle. Bieszczady, just 3,800 metres to go! Further to our recent post about the Bieszczady Forest Railway, we hear through the grapevine that only, 3,800 metres of track remain to be relaid to allow BFR trains to operate from the standard gauge station at Lupkow. 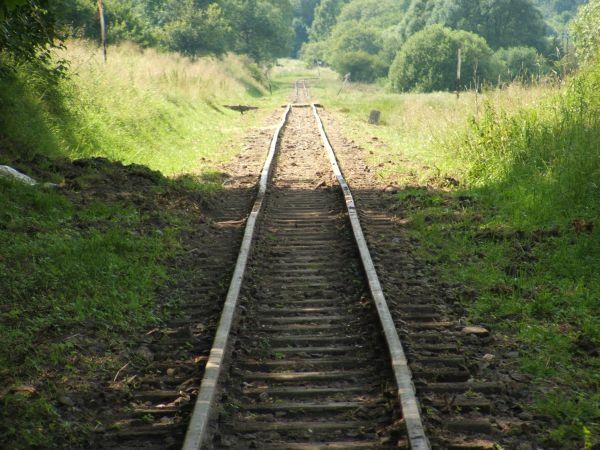 The work, which involves replacing 90% of the sleepers, has been budgeted at 100,000 PLN a kilometre, so the railway needs another 380,000 PLN to reach its destination. Already, some 3,200 metres of line has been relaid from Wola Michalowa to just past Smolnika. (If you scroll the map to the West, you will reach a junction where the former BFR main line continued North to the sawmill at Rzepedz. That junction is Smolinka.) If the relaid line can be inspected and certified in time, the BFR hope to extend their services to Smolinka, this summer. The rebuild of the Kp4 locomotive acquired by the railway needs another 150,000 PLN to complete. That’s only £34,000! Is there anybody out there who would like to see regular steam trains return to the BFR and who can afford the price tag. Track on the Wola Michowa – Lupkow section of the BR emerges from the undergrowth after more than 10 years. 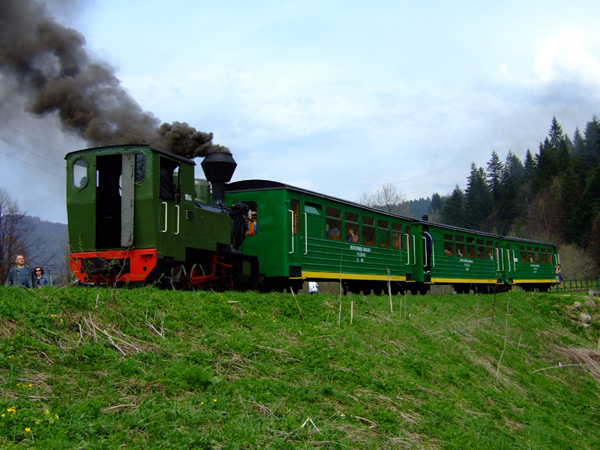 The Bieszczady Forest Railaway is Poland’s premier narrow gauge railway. It was the first Polish railway to be preserved and achieves some 100,000 passenger journeys each year. The line has an excellent website with many photographs. The WWW pages sport a competent English translation. 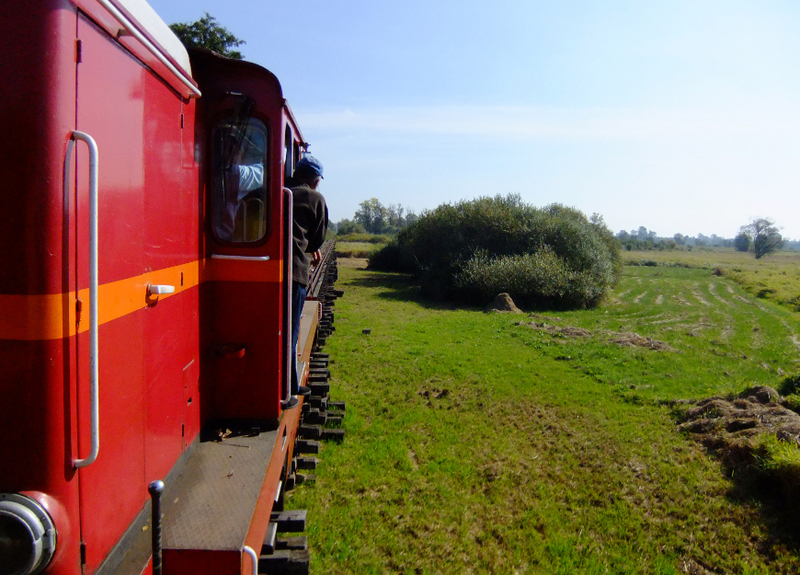 The line is one of the few Polish heritage railways that has achieved security of tenure. 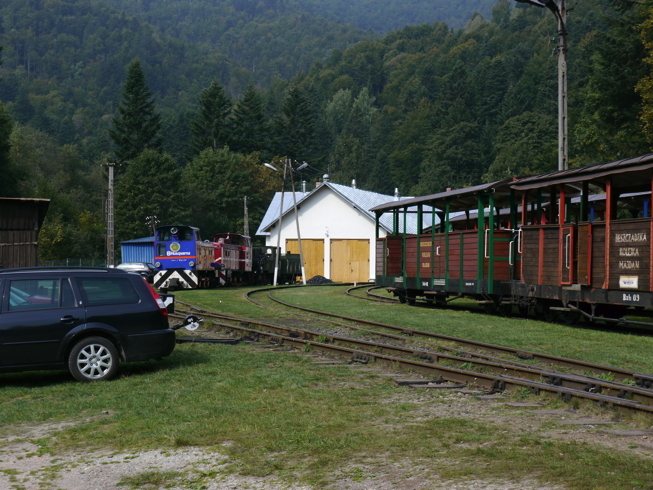 In 1997, the Fundacja Bieszczadzkiej Kolejki Lesnej (Bieszczady Forestry Railway Foundation) managed to acquire the railway, the associated land and buildings and some – but not all the former rolling stock – from the Polish Forestry Commission. In some ways the line resembles the Talyllyn Railway in North Wales. Both lines run through an amazingly beautiful landscape, mountainous yet lush and verdant. After over a hundred years of doing without, the TR has only relatively recently fitted its trains with continuous brakes, the BR has yet to do so. However, there are differences. The Talyllyn Railway relies heavily on its volunteers, the BR on its – seasonally employed – paid staff. The future of the TR – the first preserved railway in the world – is secure. The BR, like all Polish narrow gauge lines, operates on a financial tightrope. It only needs the Polish government to create one more thoughtless railway regulation – Polish heritage railways are the most regulated in Europe – and the delicate financial balance of the railway would be plunged into crisis. Revenue from BR’s popular tourists trains covers operating expenses and generate a small surplus which the Foundation invests in repairing the track and rolling stock. 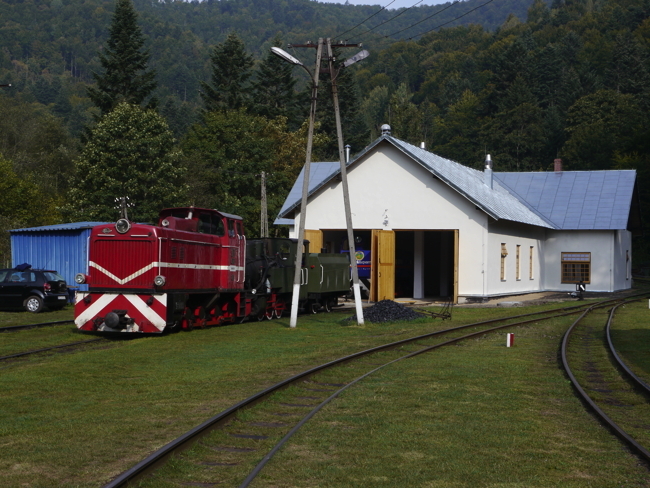 In addition the BR, with financial help from the Carpathian Foundation, had started the task of restoring the disused 7km of track from Wola Michowa – to the standard gauge station at Lupkow. But spiralling prices meant that there was not enough money in the kitty to complete the job and the extension has been suspended. The rebuild of the Foundation’s Kp4 0-8-0 steam locomotive, a class which once ran on the line, has also been put on hold for lack of cash. 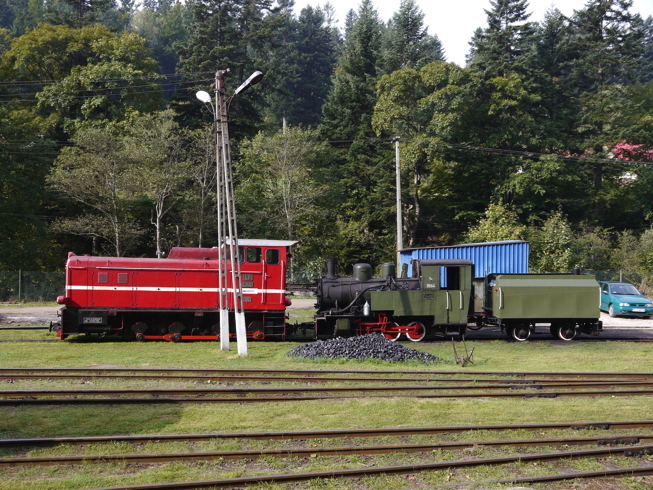 Most of Poland’s narrow gauge railways haul their tourist trains with diesel locos and the BR, which employs Lyd2’s for the purpose, is no exception to the general rule. It’s a pity that a Kp4 in working order was taken by the Warsaw Railway Museum from the BR to work the Sochaczew Museum Railway. It’s an even greater pity that Mr Sankowski, the director of the museum, does not see the mutual benefit which would accrue if the locomotive was allowed to return to the BR. The BR’s diminutive LAS 0-6-0T is not powerful enough to haul regular passenger trains on the line’s steep gradients, although it is sometimes employed on short special trains. 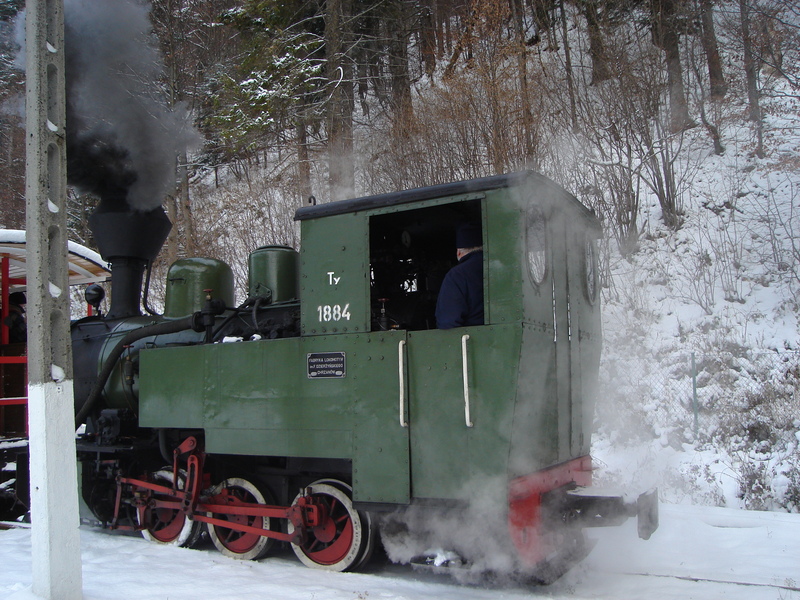 This year’s season on the Bieszczady Railway starts on May 1st. You’ll find the current timetable here. There’s plenty to see, both on the line and in the glorious countryside. The BR is certainly a line that I recommend checking out.